If you are a small business owner who makes money off their website, you've probably heard about Google's Penguin update - the algorithm change that rendered a big number of previously used link building methods "illegal". Penguin left many site owners scratching their heads, wondering which link acquisition tactics work after the update. One such method that still allows you to play it safe is so-called broken link building. It consists in finding broken links located on other people's sites, and getting them replaced with links back to your site. For broken link building purposes, it's better to look for sites that don't look overly SEOed - it's best to search for the mom-and-pop kind of resources that are part of one's hobby, non-profit interests, etc. The elements of this chart are flexible. Instead of looking for amateur blogs, you could search for niche sites that have a "recommended links" page, or search for relevant blogs that have a "resources" list - whatever works. For you to get a better grasp of how broken link building works, let's pretend I have a health foods site that I monetize by selling my e-books. If I wanted to do some broken link building for it, where would I start? I'd first look for sites that may have broken link building opportunities open. By before I search for them, I need to know which keywords to search by. Hence, the first step would be keyword research. If you have a commercial site, most likely you already have a list of keywords you use for SEO. However, this list is not exactly suitable for broken link building research, because it has keywords selected based on their ability to drive Web traffic. What we need for our broken link building quest is not necessarily popular, but highly relevant keywords. The ones that'd help us find a large number of websites in the niche. So, to expand our list of SEO keywords, let's use Google Keyword Planner, a free Google AdWords keyword tool. 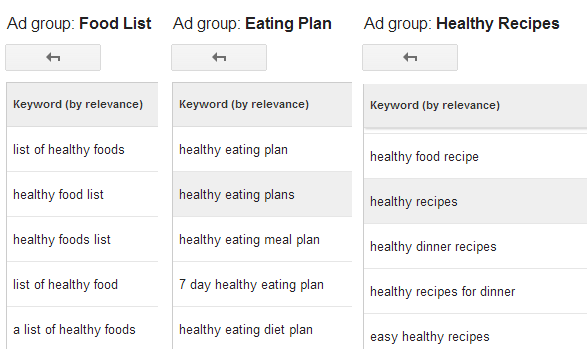 To be able to use these keywords outside the Keyword Planner tool, let's add them to the AdWords plan (press the arrow at the end of the line), and click Copy to clipboard. Now that we have a list of niche keywords to use, let's look for relevant sites in the health foods niche that may have broken links on them. The easiest way to look for relevant sites is by simply performing an online search for the keywords we've selected during Step 1. However, to make it better-targeted, let's use Google's advanced search operators to find webpages that are in fact blogrolls, lists of recommended resources, etc. For example, if you use quotes (' ') around the keyword, Google will look for pages that are relevant to your keyword and contain the word in quote marks. *Replace [keyword] with any keyword from the list. Now, if you'd like to do the same thing faster, you can use a tool that lets you scrape Google's search results for given keywords. One such software is LinkAssistant, since it allows you to look for fitting webpages according to a list of search terms. So, how can one do this with LinkAssistant? First, you'd need to start a project for the site you're building links for. Then click the Search button and choose Find sites by keyword search. As you can see, I have also checked the Enable expert options box. This will let me perform a more refined search. 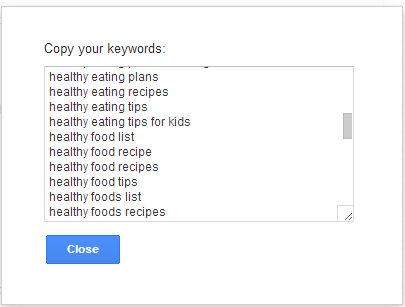 At Step 2, you should enter the list of keywords. And, during Step 3, let's choose Google.com and Google Blog search as our preferred search engines. At Step 4, you can set the maximum number of sites to find per each search round. The higher the threshold you set, the longer it may take the software to look for potential niche blogs, especially if you have a long list of keywords. Step 5 is important, while at this step you can set additional filters that will let you search for just the right kind of sites. Let's say, I would like to look for sites with pages like "blogroll", "resources", "partners", "links", "recommended", "useful", "recipes", etc. At Step 6, remember to check the Get complete URLs box, or else LinkAssistant will only collect top-level domains for the webpages that potentially have broken links. When all the steps are covered, hit Search and wait for LinkAssistant to find the websites that match the predefined criteria. Once we've got a list of relevant webpages (it doesn't matter whether it was formed by hand or using software), we need to sort out any websites, links from which wouldn't do anything for our site SEO-wise. If you've been building your list by hand, you can use a free browser plugin like SEOquake to separate the wheat from the chaff on the fly. 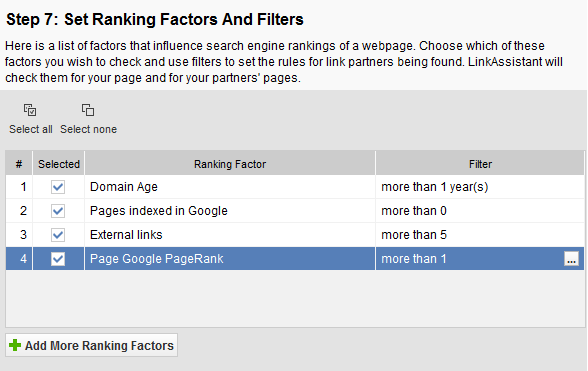 The plugin will tell you each page's PageRank, Alexa Rank, age, the number of backlinks that point to it, etc. right in the SERPs. Knowing these parameters, you can discard webpages that are unlikely to help your site's SEO even if you managed to get a link from them. For instance, the number 1 results page (see screenshot above) isn't a promising link prospect, since it has PR n/a, zero links pointing to it, and overall has poor metrics. Once the metrics are updated, you can slice and dice the list of webpages in any way you'd like. For instance, you could sort them by domain age, by PageRank, by the number of external links on a page, etc. This way you can easily remove any sites that'd be a poor fit for your broken link building campaign. So, at this point we have a list of relevant, high-quality link prospect pages. Now we need to see which of these pages have broken links. One of the tools that lets one do this is Check My Links, a free browser extension. Once you have it installed, it'll mark any broken links on a page red. What I'm going to do now is I am going to start with the most aged and high PR pages on the list, and visit them one by one, in order to see if any of them contain broken links. *To access a page under analysis from LinkAssistant, click on the three-dot button next to the page's URL and choose Open with external browser. Now, as I scan the pages with Check My Links, I can see that this page from Dotti's Weight Loss Zone has quite a few broken links (23). 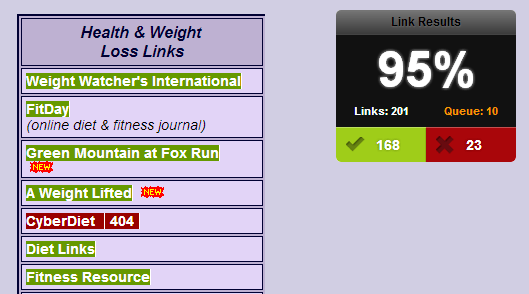 In the Health and Weight Loss Links section, one can see a broken link (pointing to a 404 page) that could be a good candidate for being replaced with a link to my dummy site. Once we know which links are broken (and hence may be replaced with links to our content), we should find out what exactly used to be located at those Web addresses that now return a 404 status (page missing). This is for us to decide if we have a suitable piece of content to offer as a replacement. WayBack Machine, a free Internet Archive, lets one see the content of pages that have been taken off the Web. 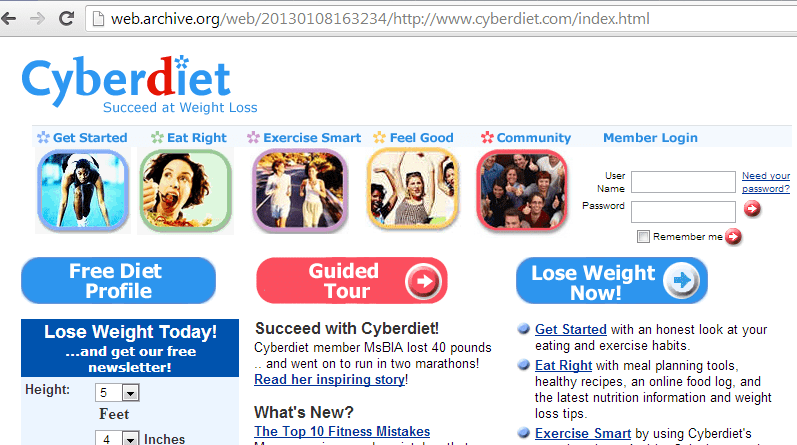 So, let's use this tool to see what this page - cyberdiet.com/index.html - used to look like before it turned 404. Web Archive happens to have a snapshot of it from March 10, 2013 (below). It looks like this pages used to be about weight loss. Hypothetically, if I had a page or a section on my site dedicated to losing weight with healthy diet, I could pitch the editor of Dotti's Weight Loss Zone with the suggestion to replace her broken link with a link to my site. So, once we know which site owners to email, we'd need to get their email addresses for further action. 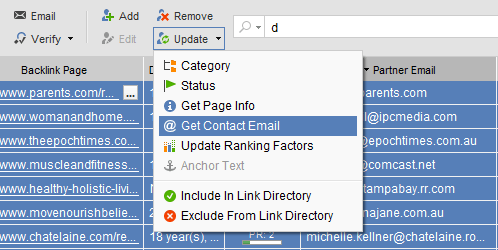 With LinkAssistant, this can be done by selecting the necessary link prospects and clicking Update -> Get Contact Email. If you use LinkAssistant for broken link outreach, you will also be able to bulk-email all webmasters at once by selecting the people to contact and clicking Email. Most of the time, you wouldn't know if the person behind the info@... email is the right one to reach out to. Hence, it's better to first shoot a quick email saying that you spotted some broken links on the website, and ask for the Web address you could send the details to. This way your pitch will be better-targeted. Provide as much value to the webmaster as possible. Point out the exact pages and the exact broken links. Make it easy for the webmaster to just copy and paste your link into HTML. If you receive a positive reply from a webmaster and they say they've put a link back to your site, you can go to the page where it is supposed to be and check if that's true. To view the page's source code, press Ctrl+U (for Windows or Linux) or Command+U (on a Mac), and search for your site's URL to see if the link is there. For example, to see if Dotti's Weight Loss Zone has put a link back to my site, I go to www.dwlz.com/links.html, press Ctrl+U, then CTRL+F and search for my site's URL. Also mark the anchor text, which is "Virtual Diet Center" in this case. Post-Penguin, it's better NOT to use your main commercial keywords (the ones you'd like to rank for on Google) as link anchor texts. Instead, strive to use your brand name, the name of your product, or random words such as "a useful page", etc. Now, if you've been using LinkAssistant for broken link outreach, you'll be able to see responses in the Email tab. If the website links back, you'll see Yes in the Verification Passed column. LinkAssistant will also inform you of any links that are missing or of any links that don't have the desired anchor text. That's it! 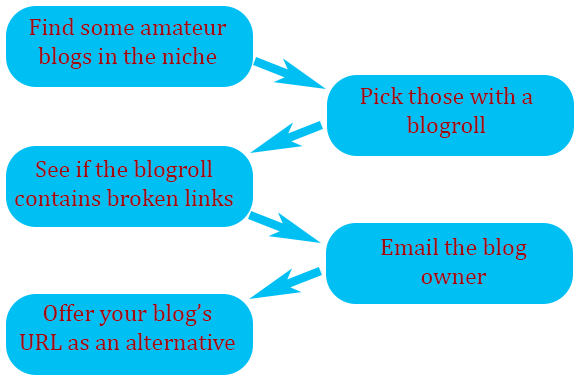 This is how you can do broken link building for a site in your niche in 7 basic steps. From time to time, you can return to Step 4 and see if any webpages on your list that didn't use to have broken links, began linking to non-existing pages. Plus, you can always look for more search terms by which you discover new broken link building opportunities. Image credits: CandyBox Images at ShutterStock, Ali Karimian at Flickr.